Recruitment offers are being offered at Bannu Medical College Jobs 2019 For Faculty & Non-Faculty Staff. Here this page is providing the best career opportunity from Bannu Medical College which is seeking to hire the eligible, adroit and caliber applicants are required to apply for the Faculty and Non-Faculty Staff posts which are given below. 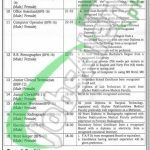 Jobs in Bannu Medical College Bannu are such as (Accounts Officer, Admin Officer, Forensic Technologist, Lab Technologist/Microbiologist, Librarian, Female Warden, Assistant Librarian, Audio Visual Operator, Pharmaceutical Chemist, Office Assistant, Computer Operator, S. S. Stenographer, Junior Clinical Technician, Junior Clerk, Assistant Mortician, Forensic Radiographer, Electrician, Store Keeper). The eligibility criteria for these vacancies are Masters/MBA/M.Com/MSc/BBA/Bachelors/Intermediate/Matric qualification is required. The medical degrees should be recognized by PMDC and relevant expertise in the similar capacity is required. Now, I will let you know about its further details below. BMCKP is abbreviated as Bannu Medical College KPK & Medical Teaching Institute is the Govt Institute which is providing the best medical service of education in the medical fields with professional teachers are there to teach the students. Being a Govt body it offers Govt jobs of different educational levels. Application form can be downloaded from the official website of this college as www.bmckp.edu.pk. Duly filled the application form with educational and experience certificates, PMDC Certificates and application processing fee of Rs.1000/ for Sr No. 1 to 6 and Rs. 500/ should be paid for Sr No 7 to 18 should be paid in favor of BMC Bannu. Last date for applying is February 07, 2019. Late received and incomplete applications will stand rejected. Last Date To Apply: February 07, 2019. Address: Bannu Medical College, Bannu, KPK.